As I had promised, this post will be about using the Ant algorithms I had discussed in the previous post to solve a complex computational problem. But, before we go on, let us have a look again at Ant Colony optimization. 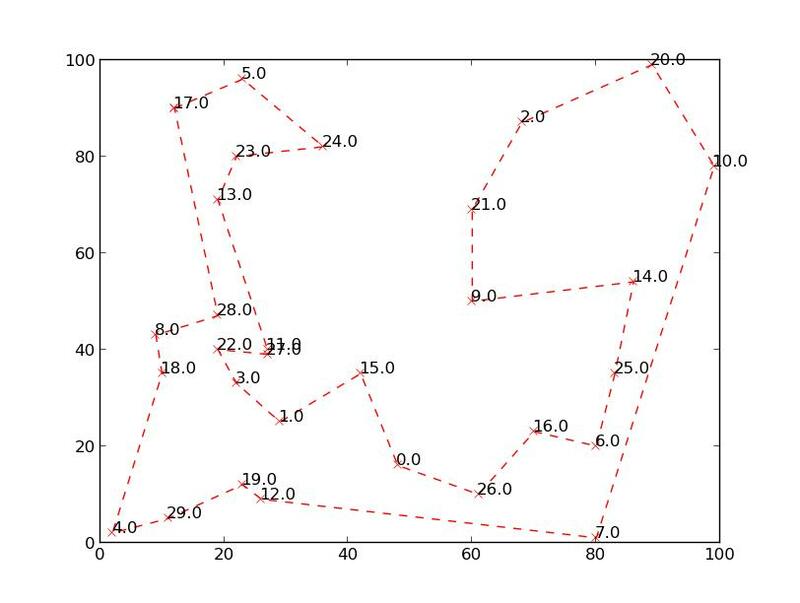 Ant Colony Optimization is basically a group of algorithms used to find optimum paths in a graph. It does so by mimicking the foraging behavior of an ant colony. As I had said before, ants use pheromones to communicate and thus the amount of pheromone on each path decides the optimality of the path. Thus, an ant is more likely to take a path with more pheromones on it. We use this concept and basically create ‘Agents’ that we call ‘Ants’. Each Ant is placed at a node and is the allowed to traverse the graph. At the end of it’s tour, we calculate the amount of pheromone on each edge of the path and then assign a probability value to it based on the amount of pheromone and the ‘visibility’ of the next node. Thus, by using a no. of ants and allowing them to traverse the graph repeatedly, we get the optimum path. Thus, we actually mimic the co-operative nature of ants in a colony to solve optimization problems. There are N cities randomly placed on a map. A salesman has to visit each city and return to the starting point such that he visits each city only once. The problem is to find the shortest path given pairwise distances between the cities. This problem was first formulated in 1930 and is one of the most intensively studied problems in computer science and optimization. The problem is NP hard in nature. We will discuss NP hard and other such classifications in a future post. It has got several exact and heuristic solutions, so problems with large numbers of cities can be solved. Ant colony Algorithm is one of the methods of finding a solution. The following source code has been mostly sourced from M.Tim Jones’ AI Application Programming (1st Edition) by Dreamtech. I have made slight modifications to the code and also written a python script for visualizing the problem. Let us first define the parameters required for the Ant Colony Algorithms. MAX_CITIES refers to the maximum number of cities that we have on the map. We also define the maximum pairwise distance between the cities to be 100. Thus, worst case scenario, modeled by MAX_TOUR represents the tour in which the ant has to travel through MAX_CITIES*MAX_DIST. Here, we also define the no. of ants to be 30 i.e. exactly equal to the no. of cities on the map. It has been determined experimentally that having the no. of ants equal to the no. of cities gives the optimum solution in less time than having more ants in the system. 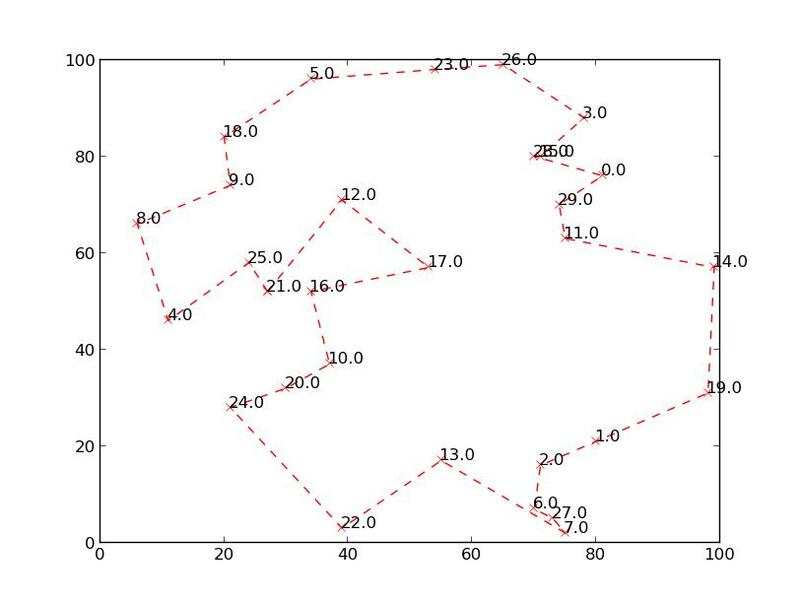 Now, we create the environment fro the Traveling Salesman Problem (TSP). Here, we have defined a struct cityType which contains the members – x and y. These represent the co-ordinates of the location of the city. We follow this by defining the struct antType which contains the members necessary for an ant to function. The integer values of curCity and nextCity represent the indices of the current city and the next city to be visited on the graph. The array, tabu refers to the list of cities already traversed by an Ant whereas path stores the path through which the Ant has traveled. The value tourLength is the distance through which the ant has traveled as of the tour. Now that we have set up the basic setup of the problem as well as created the ants required for simulation, we will move on to defining the parameters by which the algorithm will converge to a solution. We also declare the no. of maximum tours that the ant undertakes as 20. We also have declared a maximum time constraint in case the algorithm is not able to converge to a solution. We then weigh the edges with pheromones with the value of (1/MAX_CITIES). Now, we declare an array of cityType structs which will contain be defining the nodes of our graph. We also create an array of Ants with the size equal to that of cities. The double dimensional array dist records the pairwise distances between the cities whereas the array phero records the pheromone levels on each edge between the cities. The variable best is used as a control variable for recording the best tour after every iteration. The above snippet of code is used to initialize the entire graph and the Ants that we are going to use to traverse the graph. We basically allot random co-ordinates to the cities and then compute the pairwise distances between them. Also, we initialize the ants with an Ant on each node of the graph. We also initialize the rest of the properties of each Ant including the tabu list and the path. The next part of the algorithm is to restart the ants after each traversal by returning them to their original positions. We also store the best path and the value of the best path in the global variables that we have defined. This set of functions is used in the process of selecting the next edge to traverse. Each ant in the environment selects the next edge in accordance with the equation discussed in the last post. Here we have a simple reciprocal function of distance as a measure of visibility as well as the actual value of the pheromone itself as the function to represent pheromone. There has been extensive research in this domain such that these functions may be replaced by other suitable heuristic functions. For the simple TSP that we are going to solve, the functions thatwe use prove to be a good enough measure. Now comes the actual process of simulating an ant colony. The following function is an example of simulating the ant colony to solve the TSP. The next snippet of code is simply a helper function which emits all the data into atext file so as a python script can present it in a better and easily understandable form. Here we simply run the simulations and keep on updating trails and restarting the simulation with the updated trails until the no. of iterations does not exceed MAX_TIME. This ensures thatthe simulation terminates regardless of whether the ANT agents converge onto a solution or not after a set no. of iterations. This is the primary code for the Ant Algorithm solution for the Traveling Salesman Problem in C++. Now, I have written a small python script which plots the data using matplotlib and creates a beautiful graph for us to view. Hey guys, Thanks for the great response on my previous article. Today, I will be writing about a brilliant algorithm called Ant Colony Algorithm. Ant Colony Algorithm or Ant Algorithm as it is popularly known as, is basically an optimization algorithm based on swarm intelligence. It mimics the behavior of an ant colony foraging for food. This algorithm was first proposed by Marco Dorigo in 1992 as his PhD. thesis. It is a part of the amazing world of swarm intelligence wherein a swarm of low ability agents are used to solve complex problems. Ants are perhaps one of the most amazing creatures in this world. They are nearly blind but still mange to navigate through difficult terrain and find their way to food and back. Not only that, they can lift up to10 times their body weight and perhaps one of the sturdiest creatures of the insect world. The major reason of their success in the battle for survival is the fact that they co=operate with each other. The survival of the ant colony is foremost rather than survival of a single ant. It is this co-operation and communication that we attempt to model through ant algorithms. Now, ants have an amazing method of navigation. They use pheromones to communicate the optimal path to any point to other ants. This works in the following way. An ant finds a food source. Other ants also reach the food source through various paths. Now, based on the time taken to complete each trip to and fro, the shortest path will have the most pheromone as it has been traversed the most. As the amount of pheromone on each path dictates the probability of that path being taken, more and more ants will be traveling on the optimal path. Thus, using several ants, the optimal path to a food source is obtained. We attempt to mimic this behavior by using agents that we call ants. 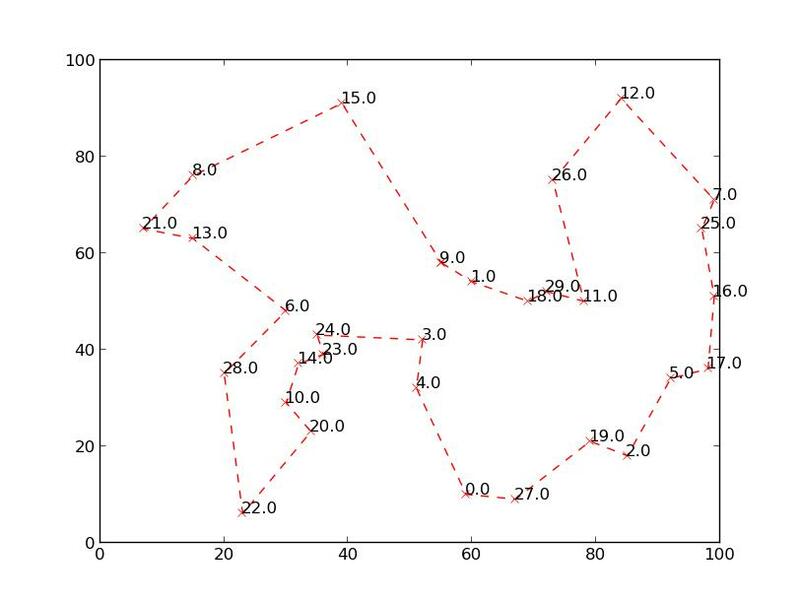 To solve a problem using Ant algorithms, we model it as a fully connected bidirectional graph. You can read up more on graphs and graph theory here. On each node, we place an ant and then ask it to traverse the other nodes on the graph thus completing a trip. The constraint on the ant is that it must visit each node only once. As it travels, we calculate the pheromone levels on that path based on its length. Upon the completion of each trip( known as a Tour), we replace the ant on a node and send it on its way again. But each time, it reaches a node, the probability of it taking the next edge is given by the amount of pheromone on that edge. Thus, in the end, through traversing the graph, we find out the most optimal path. For example, lets take a situation with 2 ants and a food source. Now Ant1, who will call Han takes a path with 2L distance to the food source whereas Ant2, Luke, takes a path with distance L. Now both lay down small amounts of pheromone as they pass. Now Luke completes the trip to the food and back in time T, while Han takes 2T, assuming both travel at the same speed. He takes the food and returns back. And then proceeds on his second trip. While he starts of his second lap, Han is still just at the food. So, when Han returns back, Luke will have completed two trips. Thus, there is approximately twice the mount of pheromone on the Luke’s path as compared to Han’s path. So, next time, Han will be more probable to taking Luke’s path based on simply the amount of pheromones. So, how do we calculate the probability of an ant taking the path? Before that, we also add another factor to the situation- that the pheromone evaporates as time goes on. Thus, paths which are poor are discarded more easily. Now, we need to describe the probability equation governing the movement of ants. 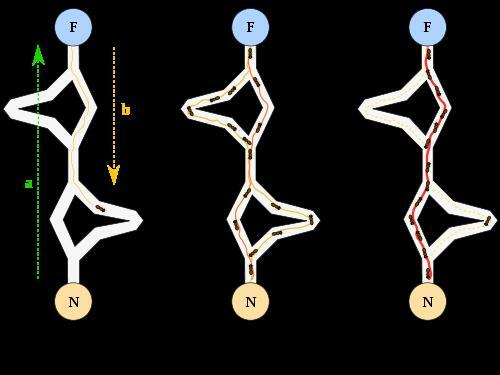 Here is the intensity of pheromone on the edge between the nodes r and u. is actually a heuristic function which represents the inverse of the distance between the nodes, is the weight for the pheromone, and is the weight for the distance of the edge which can be modeled after visibility. is the no. of edges not traversed yet. This formula can be said to be the ratio of the weight of an edge to the sum of the weights of all untraveled edges. Thus, this will give us a probability based on the amount of pheromone deposited and the distance of the edge. Both of these values will help us in converging to an optimal value. Here is a constant and is the total length of the tour. We then use this value to calculate the total pheromone value due to a single ant after a tour. We have to note that this operation is carried out only after the tour is completed as the pheromone levels are inversely proportional to the length of the tour. Constant is a constant between 0 and 1. Here, we are using the inverse coefficient of the weight of the change in pheromone levels on a n edge to model evaporation. This proves to be an efficient way to discard edges which are not optimal. As each ant completes it’s tour, we update the edges based on the equations above. Then, we restart the entire process with the ants being placed on nodes once more and then allowed to move according to the updates edges. hence, we can see that more and more ants will converge to a single path. The no. of iterations can be controlled so as the algorithm ends when there is no change in the value of the shortest length for a few iterations. This concludes this post. In the next post, we will use the discussed Ant algorithm to solve a famous computational problem – The Traveling Salesman Problem. Recently, I have been fascinated by algorithms generally used for AI. Simulated Annealing is one of the basic algorithms for finding solutions a constrained problem. I have been greatly helped along this path by a book : Artificial Intelligence Application Programming(1st edition) by M. Tim Jones. Annealing is a process in which a metal is first heated to a high temperature and then slowly cooled down resulting in formation of large, ordered crystal structures. The output of this process is dependent on the time taken for the cooling. Faster cooling times result in formation of brittle, fragile structures while slow cooling results in the formation of large stable crystals. Simulated annealing as the name suggests, is creating an algorithm which mimics this cooling process. Basically, several problems of varied nature can be solved by creating an analogy with the annealing process. Many problems can thus be equated to the annealing process. For example, given a minimization problem, we can equate the ‘Energy’ of the solution to the value of the objective function and then randomly tweak the values within the given constraints to find the minimum solution. 1. Create an initial solution. 3. Randomly tweak the solution. When the temperature reaches a certain predetermined value, the current solution which satisfies all criteria is outputted as the best solution. To model this, let us assume that the lower the ‘energy’ of a solution, the better it is. Now for the algorithm to converge on a solution, we must propagate the solutions having lower values of energy. Thus we use the acceptance criteria for that. So, if the new solution is lower in energy than the current solution, we move on to reducing the temperature. But, if the working solution is worse, then we have an acceptance criteria which we can follow. In simulated annealing, we use an acceptance criteria based on the laws of thermodynamics. The following example is a basic example of simulated annealing. A very famous problem, it was first solved by Carl Friedrich Gauss in 1850 by trial and error. Since then, several methods have been used including divide-and-conquer, depth first, genetic algorithms etc. The problem in it’s conception is very simple. We have an N x N chess board and we have N queens. Now, we have to place the queens such that there is no conflict between any two queens as per the familiar rules of chess. As a queen can move diagonally, vertically and horizontally, we have to ensure that for an acceptable solution, there must be only one queen in each column and row and it’s diagonals must not have any other queen. Lets take an 1 x N matrix. The index of the matrix is the row index of the position of the queen while the value at that index is the column index of the queen. Thus we have defined the position of each of the N – queens. Now, we randomly allocate each of the queens on the board such that no 2 queens occupy the same row or column. This can be easily ensured by checking the condition that the value at each index is not equal to any before it. MAX_LENGTH is the no. of queens i.e. N.
The temperature parameter basically defines the region in which the solution is being searched for. As the temperature decreases, the range of the solution space also decreases thus resulting in an optimum solution. The higher the temperature, the more time it will take for convergence but also there is a greater probability of finding a solution. Now, the final temperature cannot be zero as the value of the exponent then cannot be calculated. Thus, we try and take the value as close to zero as possible but at the cost of time. I tried several values and found out that at 0.5, the algorithm converges to a solution for even large N’s in a fairly decent amount of time. This function can be any decreasing function of T including non linear functions. I used the above one because it is the easiest to analyse. Now, at each temperature, we allow for 100 iterations for a best solution to emerge. This solution is then propagated to the next temperature. This can be imagined as moving up or down a hill until we find a ditch which represents over optimum value. Then we can start following that ditch until we reach the actual global minimum. To ensure, we stay within the constraints of the ditch, we decrease the temperature and keep decreasing it with every 100 steps until at last we find a solution. Thus we can see that STEPS must be sufficiently large while ALPHA must be as close to 1 as possible so as to generate the optimal solution. But we must also keep in mind the timin constraints for the program to find a solution. We create a struct for each solution in which we create an array representing the solution and the energy associated with it. This is a simple function which will help us create a randomly perturbed solution. This function initialises the first solution. This function is used to compute the energy of each solution. We define energy as the no. of conflicts. Since, we have ensured that while tweaking, we avoid placing 2 queens on the same row or column, we can easily reduce the complexity of finding the no. of conflicts to checking the diagonals of each queen. In the main program, we have created two loops. The outer loop deals with the temperature and reduces the temperature after every STEPS steps. The inner loop on the other hand is an implementation of a Metropolis algorithm. I will surely discuss the Metropolis algorithm in detail in some other post. 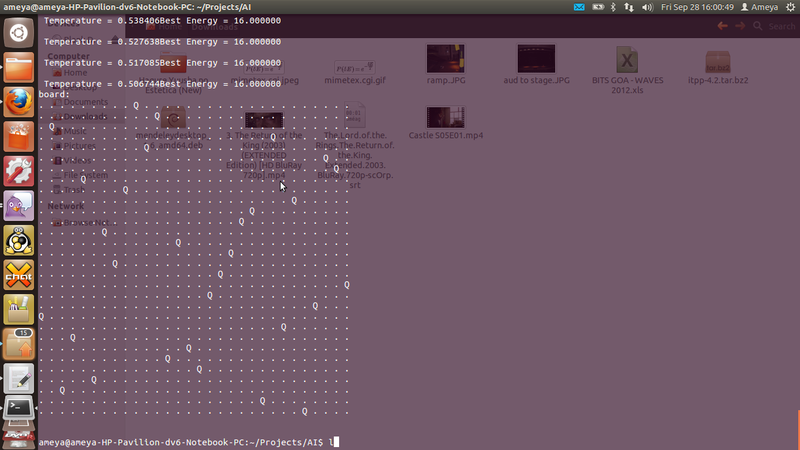 But, for now, what it basically does is that it picks up a tweaked solution and computes it’s energy. If the energy of the solution is lower than the energy of the current solution, then it replaces the current solution by the tweaked solution. But if the energy is higher, it calculates the difference between the current and the tweaked energy, calculates it’s probability as according to Formula 1.1 and then compares it to a randomly generated threshold value. The reason for doing this is that if the algorithm encounters a local optimum, it may get stuck in the same place thus causing the algorithm to fail. Due to the Metropolis Algorithm, we avoid this by allowing the solution to take values which may not be the best for that iteration. The solution that we have thus far obtained is then compared to the best solution we have so far. If it’s energy is lower, we copy the new solution into the best one at the end of each temperature change. The program will terminate when we reach our chosen final temperature thus giving us the optimal solution. Here’s a screen-shot of the output. Much of the source code is provided in the above mentioned book. The following post will proceed on with Ant Algorithms. Thanks for reading and please contact me for any questions. It’s been a long time since I posted something here. But here it is. 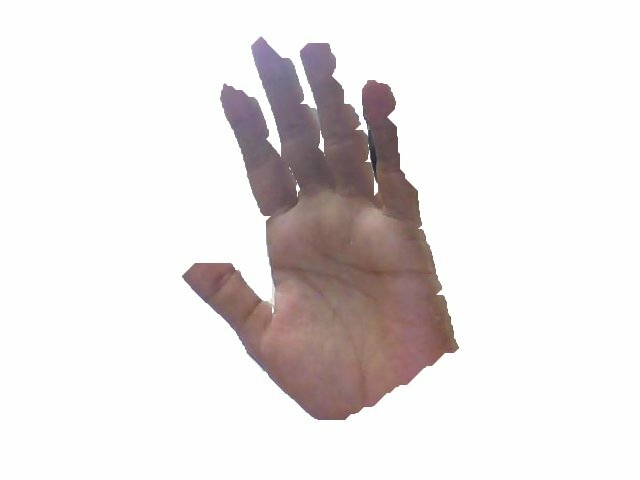 I started my current project with a simple objective- I wanted to build a completely natural human- computer interaction system. Basically, my final aim is to just have a few cameras and microphones work as the input devices instead of a mouse and keyboard. 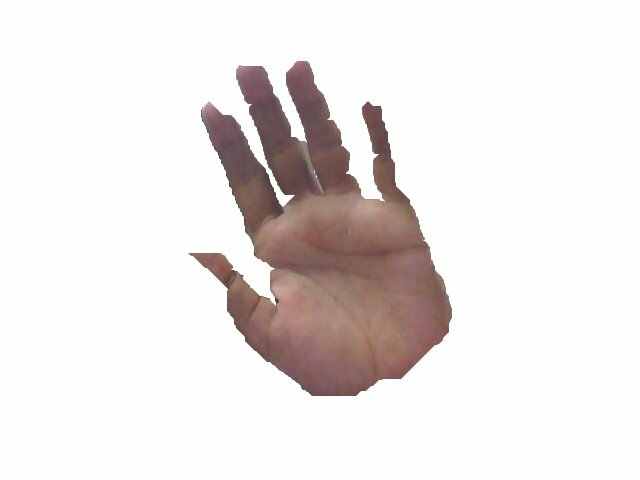 So, with this in mind, I started out with my first objective- to segment out and track the hand in a video stream. The first problem that I encountered was that skin as such is not a single color but a heady mixture of reds, yellows and white.The problem is simplified a bit in the HSV colorspace, but not enough. A simple thresholding program will not work at all given such few constraints. So, while researching on how to solve this problem, I got a paper mentioning color predicates. Now, what are color predicates? Color predicates, very simply put are a map in the colorspace. A simple region within which every color included is taken as being part of the colors to be segmented and outside of which are the rejected colors. So, I decided that this was the way to go. Took me a couple of days but I was able to build a simple color predicate training program. I used a matrix of 255×255 to represent the Hue and Saturation values possible. I then provided several images of my hand cropped onto a white background ( Used GIMP – awesome piece of software ). Then I scanned each image pixel by pixel and rejecting white, I simply incremented the value at each H,S index of the matrix if I found a color other than white. Now using this simple algorithm, I trained a color predicate for around 20 images taken in various illumination schemes. With a few manipulations for rejecting low values, I then used the color predicate for simple thresholding of images in my video stream. The best part of this exercise was when I looked at the HSV map thus created in a text editor….amazingly, there were two different regions which could be clearly seen, corresponding to the red spectrum and the yellow spectrum. In the next post, I will be describing my attempt to use the created color predicate.